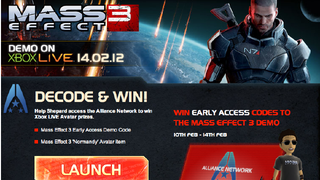 North American gamers have been trying since about Friday to win their way into early access to the Mass Effect 3 demo, which begins on Tuesday. European gamers also get a chance with their own Facebook game. Europe's Mass Effect Mission Command app involves a hacking minigame but the chances of winning also seem to be as random as North America's. You get three chances to hit four buttons in any sequence and hope that "unlocks" the system. If you miss all three, you can try again in two hours. The T&C say this is only for residents in Europe (there are versions in UK English, French and German). Good luck.